New technologies are constantly emerging to assist those organizations struggling to support the increasing needs associated with producing high-resolution content in multiple formats. 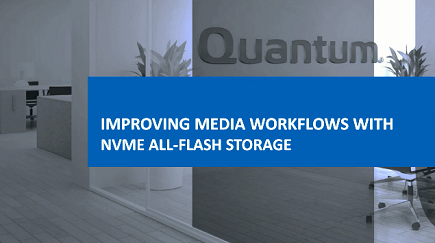 One in particular that has shown real promise in making a positive impact to supporting and accelerating production workflows is flash-based storage. However, these resources are both highly expensive and limited on capacity when compared to spinning disk. In light of this evolution in storage technology, there has been a new advancement recently developed that is adding greater efficiency and cost-effectiveness to this storage medium. In many ways it is completing the promise of what flash was always intended to be. It’s called NVMe, or non-volatile memory -- a transfer protocol that was built from the ground up to connect the host to the storage subsystem and delivers speed 2x to 7x faster than SATA SSDs. Yet even with this new protocol, it’s important to understand where it can be best utilized, as well as how it can be shared amongst multiple users.